Are You Setting Goals–Or Just Making Plans? Comments Off on Are You Setting Goals–Or Just Making Plans? January is a good time to take stock of where you’re heading, and an excellent tool for the task is my book, Setting Goals That Count. First published more than 30 years ago, it’s now available in an updated edition from Jordan Publishing. Readers say their first “Ah-Ha!” moment comes when they see the difference between making plans (which all of us do every day) and setting life goals. Life goals are snapshots of the kind of person you will be this year, next year, and for the rest of your life. That calls for deep, critical thinking. Prayerful thinking. And that’s what Setting Goals That Count leads you to do. I’ve used the exercises in this book to assess the direction of my life again and again. They are rooted in Scripture, and help me discern how I can best honor God with life decisions I’m making. They’ll do the same for you. 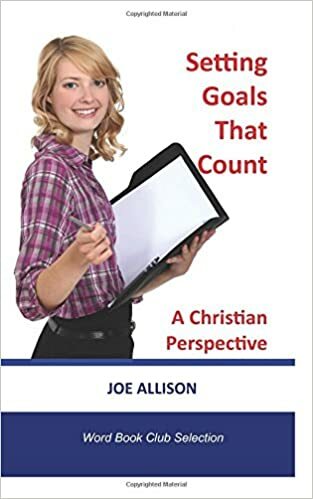 Available in print or Kindle eBook versions, Setting Goals That Count is just a click away at Amazon.com–To order, click HERE. Words may fall into obscurity for lack of use, even though they refer to realities that still figure prominently in our daily lives. Here’s one that has been little used since the days of the McCarthy hearings: propaganda. We need to blow dust off that word and reacquaint ourselves with what it means, because we are now immersed in it. The online Merriam-Webster dictionary defines propaganda as “the spreading of ideas, information, or rumor for the purpose of helping or injuring an institution, a cause, or a person.” It comes from the name of the Vatican’s Congregatio de propaganda fide (“Congregation for propagating the faith”), established in 1622 to promote Catholic missionary activity. Eventually, propaganda referred to any large-scale effort to inform the public. We find ourselves in a similar situation. Around the globe, national leaders extol their moral superiority to recruit fanatics who will trample upon their neighbors’ basic rights. They use emotionally charged words to promote their causes and dismiss the claims of others. As a writer, I’m keenly aware of the power of words. They can rescue, counsel, and encourage. They can also incite bigotry, suspicion of foreigners, and insurrection against the state. Simply because a leader says something emphatically and repeatedly, I cannot assume it is “a trustworthy saying that deserves full acceptance” (see 1 Tim. 4:9). Like the people of Berea when they first heard the astonishing news of Jesus Christ, I need to check today’s propaganda against Scripture to see whether it’s true (see Acts 17:11). My first paying job was at a county-seat weekly newspaper called the Herald & Tribune in Jonesborough, Tennessee. Founded in 1869, the H&T had survived many competitors across the years and dared to test its survival again by hiring a farm boy like me. After working part-time as cub reporter and delivery boy during my high-school years, I presented myself to the owner right after graduation and asked if he could use me full-time before I went off to college in Indiana that fall. After three days of back-breaking work and several cans of Comet cleanser, I made ’em gleam, so Bill hired me as their full-time printer’s devil. “Printer’s devil” is a term of art meaning the lowest, most servile employee of the press room–a minion who could be summoned to do any grimy, slimy job that no one else wanted to do. The term “devil” seemed fitting in an old-time printing establishment, where electric pots of lead alloy simmered 24/7 on the Linotype machines and delivery doors swung open so frequently that no one bothered to install air conditioning. It was a purgatory of a place to learn the newspaper business. I gasped the control he indicated and gave it a full twist. The press seized up. A heavy steel idler bar flew out the back and slammed into the cinder-block wall. Paper spewed everywhere while I waited for the press to coast to a stop. The pressman grinned, shook his head, and disappeared. The Herald & Tribune survived more than a century of devils like me, which is quite a tribute to the perseverance of its owners. It’s still there. There’s nothing inherently dishonest about publishing your own work. Some of the most notable Christian authors of all time started that way, including Dennis Rainey, Larry Burkett, and R.T. Kendall. In many cases, publishing was a natural outgrowth of their conference ministries; often, they had to self-publish because commercial publishers just didn’t see the potential of their work. But these authors were willing to sacrifice their time and money to spread the message God had given them. With the rise of modern printing and ebook technologies, it’s easier and more economical for authors to produce their own books. Nearly four hundred thousand new books are published each year in the United States–many of them self-published. And therein lies the challenge: How can an author get a new book recognized in the clamor of so many new publications every year? Producing a new book has never been easier, but marketing that book has never been more difficult. Here lies the root of an ethical dilemma that now plagues Christian self-publishing. Subsidy publishing (or, in the brutal phrase of publishing veterans, “vanity publishing”) panders to the naivete of new authors. It sells hope at a handsome price. The enterprise is profitable for grand old houses sponsoring it, but rarely delivers the kind of results aspiring authors expect. And there’s more. Some publicists have launched so-called “publishing houses” that are simply packages of trade advertising, planted reviews, and massive giveaways designed to inflate sales figures and secure a spot on well-known best-seller lists. Now and then, the strategy works. It creates the “buzz” that generates genuine sales. More often, it taps the author’s bank account, enriches the publicist, and does little to put the book into hands of interested readers. Merriam-Webster defines integrity as “the quality of being honest and fair.” No one can deny that today’s self-publishing promoters are profitable, but few of them ply their trade with integrity. Authors, beware. A footnote to this conversation: Ten years earlier, Philip had pulled an “F” in his English composition class at Marian College. He’d persuaded the instructor (a Catholic nun) to nudge it up to a “D” so he wouldn’t lose his scholarship by making a solemn promise that he would never write for publication. But time had passed and times were hard, so he decided to renege on his promise…at least for the church newsletter. He wrote about simple, everyday subjects with spiritual insight and whimsical humor. Eventually, someone sent a copy of his newsletter to ABC radio host Paul Harvey, who read one of Philip’s columns on his national broadcast. The next day, a call came from the publisher of Multnomah Press in Oregon, who wanted to know if he had other articles like that. Not long after, Multnomah published Philip’s first book. Soon, his work began appearing on the New York Times best-seller list. That’s right, Sister. It’s the writer’s curse! Today, I start a new blog on life in the Southern Mountains. I grew up there (East Tennessee), still visit family there, and often go there in my fiction writing. A chipmunk brought down our air conditioner a few weeks ago. Where the A/C line runs underground, there was just enough space (about an inch) for the little bugger to burrow in and chew the insulation off the thermostat wire. A repair tech advised me to fill the void with some spray foam insulation. Otherwise my wee rodent friend will come back to munch, and I’ll need to call the repair service again. Amazing to think how much sabotage can be wrought by varmints that crawl in through little gaps in our lives. Makes me wonder what other “voids” in my life are leaving me vulnerable–and how I need to secure them.